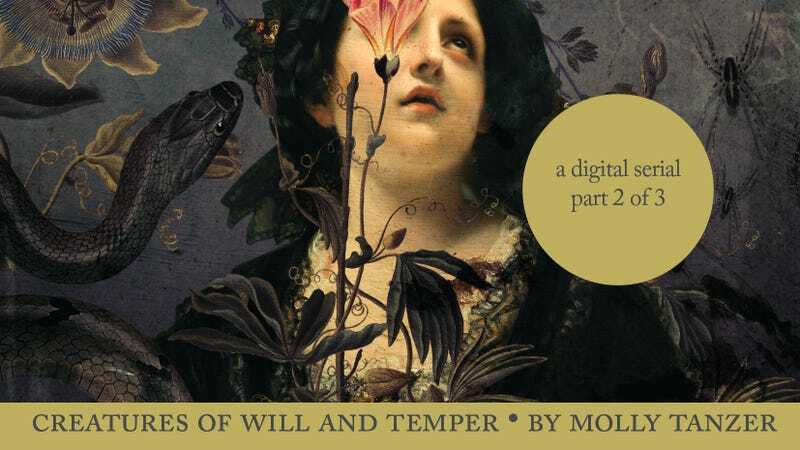 io9 is proud to present Part Two of our free serialization of Molly Tanzer’s excellent novel Creatures of Will & Temper, where two sisters learn that beneath Victorian England’s veneer of absolute propriety lies deceit, decadence, and demons alike. Cherished reader, welcome to Part Two of Creatures of Will and Temper. As with any good three-volume novel, the plot is about to thicken. Evadne and Dorina Gray, last seen being at cats and dogs with one another over your usual sisterly concerns, will find that from here on out those concerns will not be so usual. The demons, hovering at the edges of this text, are closing in. Will Dorina be the first to encounter them, as she strolls around London with Lady Henry the diabolist… or will Evadne stumble across their path? Before we discover what fate awaits our heroines, the author reminds you that in Victorian England, a three-volume novel would have cost a middle-class family half their weekly income to purchase. Lucky you are, then, that this fine periodical has graciously made this entire tale available for free…though of course, the reasonably priced electronic book and paperback editions will sate the appetites of those who are too curious to wait to find out more about the ensuing impeccable fencing instruction, imminent rooftop demon-fights, and inevitable sisterly squabbling. Oh my! That took a bit of a turn, did it not, cherished reader? What, you may wonder, will be the consequence of Dorina’s diabolism? Will Evadne’s eagerness to rid the London streets of demon-spawn result in further fencing? Fear not, endings—happy or otherwise—are nigh. Creatures of Will & Temper concludes with Part Three on June 13. So... You Like to Read?